Miso marinade adds a rich flavor to this country-style grilled chicken. Thigh meat stays moist and tender, but boned chicken breasts are delicious, too. The chicken can be sauteed in a skillet. Blend soy sauce, sake mirin, miso, green onions, ginger root and garlic in a rectangular baking dish. Coat chicken with mixture. Marinate 1 hour or refrigerate overnight, turning several times. Preheat a hibichi, portable tabletop grill or charcoal grill. Shake marinade off chicken; pat dry. Place skin-down on hot grill. Grill 4 to 5 minutes. Turn chicken; grill second side 4 to 5 minutes or until golden brown and done inside. When chicken is done, sprinkle with sesame seeds and spice mixture. For information about purchasing this book, please check the Tokyo Food Page Online Bookstore. 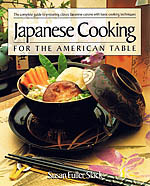 Recipe courtesy of Susan Fuller Slack, from the book Japanese Cooking for the American Table: HP Books, published by the Berkley Publishing Group, New York, New York. Copyright 1996. This recipe may not be reproduced or distributed in any form without the permission of the author.